The Czech Republic vibrates with charm and optimism…a mix of old and new, where peaceful rural hamlets share center stage with sophisticated cities and prosperous market towns. Our delightful biking and hiking routes set a comfortable pace for exploring Austria’s renowned vineyards along the Danube, then on to the lush Czech Lake District and the remarkable Bohemian Forest. This is a visit you’ll savor long after your tour ends. 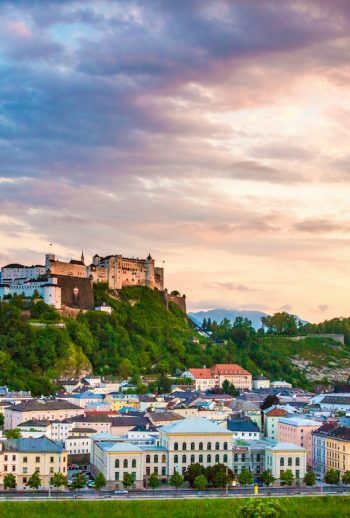 From Austria’s fabled Danube River to the lush Lake District and Bohemian Forest of the Czech Republic, this seven-day adventure is the perfect blend of remarkable history, spectacular scenery and, most importantly, world-renowned wines and beers. Follow our expert guides through this captivating hamlet of Eastern Europe and enjoy the best in regional lodging and cuisine. An experience not to be missed by either first-time travelers or seasoned aficionados! The sound of music: Enjoy a classical concert in one of Prague or Vienna's many atmospheric venues, which include ancient churches, opulent concert halls, historic buildings and outdoor theatres. The Fountain of Sampson: An impressive, gorgeous 18th-century fountain located in the center of one of the largest squares in Europe, this famous fountain once served as Ceske Budejovice's main water supply. The “Pivo": The most famous Czech drink is actually beer, or pivo. A half-liter glass is often cheaper than a soft drink or cup of coffee! We meet in the morning in Vienna and are transferred to Pöchlarn. Bicycle along the Danube through vineyards and wine villages to remarkable Melk Abbey. After your visit, continue along the famous Austrian wine route through the Wachau region to Dürnstein. Feed your appetite with a delicious meal at your hotel’s restaurant during tonight’s luscious welcome banquet. Named after Richard the Lionheart, the first true guest of note in Dürnstein, Hotel Richard Löwenherz offers guests what the illustrious English King enjoyed eight centuries ago—true royal treatment. The hotel sits on one of the most beautiful, pristine river landscapes in Europe and it radiates the unique atmosphere of a former convent of the Clares, right on the banks of the Danube. Today, hike through the woodlands, visiting the elaborate Stift Gottweig abbey, where you are treated to a lunch with an unforgettable view. We’ll enjoy the surrounding forest before heading back to Dürnstein. This evening, we enjoy an informal dinner at a ‘Heurigen’ winery. Transfer to the lovely gated town of Trebon, in the heart of the Czech Lake District. Explore the picturesque town center before mounting bicycles and biking to the lively red-roofed town of Ceske Budejovice. Tonight the group will gather together for a fun meal with traditional specialties before relaxing in your room for the rest of the night. A cultural and historical monument with a tradition that goes back to 1553, Grand Hotel Zvon is situated in the main square of Ceske Budejovice close to historical sites, theatres, cinemas, galleries, shops and department stores. The hotel features a restored fresco and a hand-carved ceiling from the 17th century, as well as two restaurants: the classic Restaurant Gourmet Symphony with a hotel bar and the lovely Pilsner Urquell Original Pub. Follow the hills toward the Bohemian Forest, then take a chairlift up Mount Klet for panoramic views. Enjoy a picnic lunch near Mount Klet. Continue through the forest before arriving in fanciful Cesky Krumlov where you will have time to sightsee on your own. Experiment at one of the many wonderful restaurants. The finest hotel in Cesky Krumlov, the Hotel Ruze was built in the 16th century as a Jesuit Monastery and University and has preserved the beauty and style of the Renaissance, even after extensive interior restoration. The Hotel Ruze is now a luxurious five-star hotel fully satisfying all the requirements of the 21st century. Amenities include a restaurant, indoor swimming pool, gymnasium, sauna, solarium and beauty salon. After a guided visit of the Cesky Krumlov Renaissance castle and the Baroque theater, you’ll canoe or kayak the Vltava river. Transfer back to Cesky Krumlov, to enjoy some free time in this amazing village. Hotel Ruze’s dining room will serve up an exquisite farewell meal for the entire group tonight. This morning we set off by bicycle to Prachatice. We’ll say good bye to one beautiful village and say hello to Prague, the capital city gem of the Czech Republic. Tonight we’ll have yet another amazing dinner on the final evening. The Hotel Paris is a 5-star luxury Art Nouveau hotel located in the center of Prague in the Old Town. It was built in 1904 and was declared as a historical monument. It offers free wellness centre access and free Wi-Fi in all areas. All elegant rooms and suites at Hotel Paris are decorated with replicas of original Art Nouveau furniture. They come with flat-screen satellite TV, a minibar and air conditioning. The tiled, spacious bathrooms have underfloor heating, hairdryers and toiletries. Enjoy one last breakfast before you are transferred to the Prague airport or Prague city. Most will opt to spend a few nights in Prague to explore its lively town center. Prior to the trip, arrive at your own convenience in Vienna. On Day 1, we will meet you in the lobby the Hotel Ambassador in Vienna at 8:30 a.m. After a transfer to Pöchlarn, the cycling begins. After breakfast on Day 7, we take you to the airport, train station, or the hotel of your choice in Prague. The Czech Republic offers some of the most pristine landscapes in all of Europe! Who can resist the alluring charm of its tiny hamlets, or the formal grandeur of imposing Baroque architecture? In Vienna, try one of the city’s famous coffeehouses like Alt Wien, Demel and Frauenhuber without which no visit would be complete. See grand old castles, historic medieval towns, and meet the area’s welcoming locals. Squeezed into a tight S-bend of the Vltava River, Cesky Krumlov never fails to impress. The Rococo theater is one of the few in the world to retain much of its original staging, with an ingenious system of flies and flats enabling it to have more than 40 scene changes without interruption of the action. Evenings, we’ll enjoy fine dining and settle into cozy inns… the best in the region!